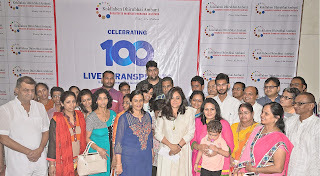 Mumbai, 3 July 2015: To mark 100 livers transplanted in just over two years of the establishment of its Centre for Liver Transplant, Kokilaben Dhirubhai Ambani Hospital held an event where donors and patients were felicitated by the hospital in the presence of leaders of the community, opinion makers and members of the media. Across India, organs to save lives are in short supply and the paucity of brain-dead donors exacerbates the problem. Every year, around 250,000 patients die of liver failure in India owing to cirrhosis, and over 25,000 patients need a liver transplant every year. However, only 1,100 undergo liver transplantation. Of this, only 5 per cent were performed in Western India, that too primarily by visiting surgeons, because of the lack of a comprehensive liver transplant setup. Although several centres offered liver transplant, the numbers were few and outcomes poor owing to the absence of city-based consultants, and the lack of requisite infrastructure and experience in living donor liver transplantation. 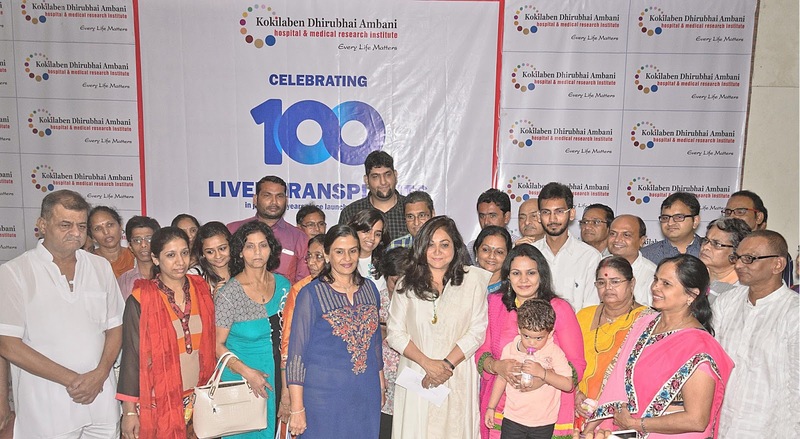 As part of its constant endeavour to bridge the gaps in the Indian healthcare system, Kokilaben Dhirubhai Ambani Hospital established the Centre for Liver Transplant as a pioneering Centre of Excellence in March 2013 to transplant livers both from living donors and cadavers with dedicated Liver Transplant Operation Theatres (OT) and a dedicated Intensive Care Unit (ICU). The Centre is supported by a dedicated, full-time team that comprised six transplant surgeons, six intensivists, four hepatologists, two infection-control specialists, four anaesthetists, one interventional radiologist and 40 specialist transplant nurses. A first for the city of Mumbai, and Western India as whole, this experienced team, backed by state-of-the-art infrastructure, ensures round-the-clock monitoring and sustained care and follow-up well beyond the surgery itself. Since inception, the Centre has transplanted 100 livers. While 15 have been cadaveric donor liver transplants, the others speak to the success of the Centre’s Living Donor Liver Transplant Programme. This programme has proved to be a change agent, right from the first liver transplant performed at the hospital on the 27-year-old mother of a three-month-old baby who had developed acute liver failure owing to medicines given to treat tuberculosis. The donor: her brother. He was the first of our living donors who have displayed their courage and generosity to help their loved ones—wife, husband, brother, sister, parent, grandparent and even distant relatives. While most donors have been in-house, some donors from Kokilaben Hospital have even donated livers for patients with acute liver failure in other hospitals in Mumbai. Further, Kokilaben Hospital’s liver transplant expertise has allowed the establishment of a centre for complex hepatobilliary and pancreatic surgery. Expertise with vascular resection and reconstruction has allowed surgery for liver and pancreatic cancers that would be deemed inoperable at most centres. With the kidney transplant team having successfully performed blood group incompatible liver transplants, Kokilaben Hospital plans to begin ABO incompatible liver transplants for situations in which no blood group compatible donor is available. On the anvil, also, are pancreas, small bowel and multivisceral transplants.